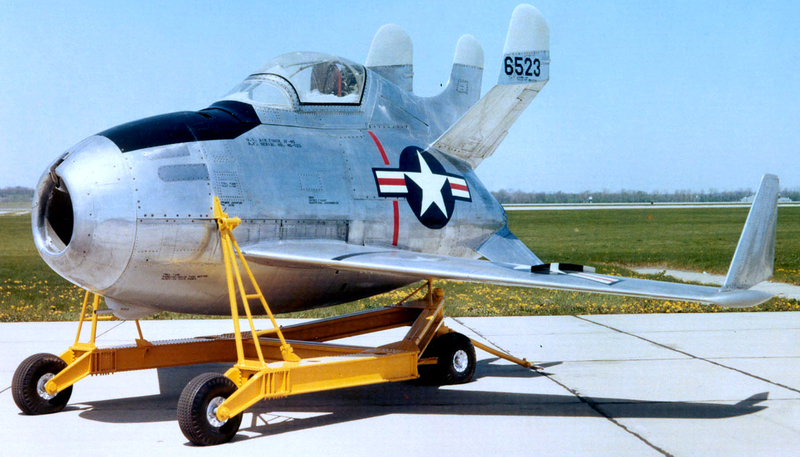 On this day in 1949, Edwin F. Schoch made the first flight of the McDonnell XF-85 Goblin Parasite fighter. After being carried aloft and launching from a trapeze suspended beneath a Boeing EB-29B Superfortress, Schoch was unable to hook back to the trapeze for retrieval and, as the aircraft were not equipped with landing gear, was forced to belly-land on the dry lake bed at Muroc Air Force Base in California. Two prototypes of the Goblin were produced and, after only six flights and 2 1/2 hours of flight time, the US Air Force abandoned the program for two reasons. First, aerial refueling of conventional fighter aircraft showed greater promise and second, the high demands on pilot skill to recover on the “mothership” bomber was never fully addressed and corrected. The two Goblins were preserved and are currently on display, one (serial# 46-0523) at the National Museum Of The US Air Force in Dayton, Ohio, and the other (serial# 46-0524) at the Strategic Air And Space Museum in Ashland, Nebraska.